Week in Review — Staggering Progress! First off — the Big One. 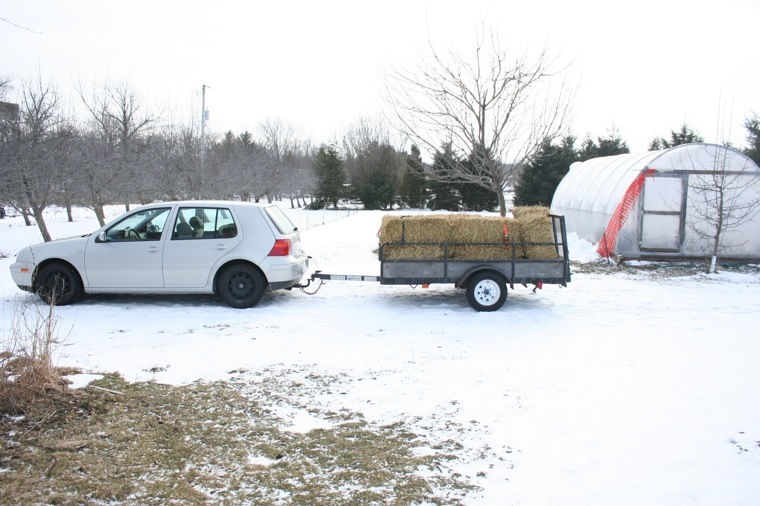 Tuesday morning I received a call from the owner of the farm where I Market Garden… I am GO for the Uber Hoopty!!! That simple, and much desired, call broke the dam on all kinds of items that I had sat on until now. Final quotes are coming in from Rimol and Farm-Tek on 30×96 Hoop Houses, my Slow Money lenders all got calls and I finalized my loan agreements. Emails went out to experts that I hope to collaborate with and I built the basics of my Kickstarter micro funding page (will release the project next week). OMG is this awesome. Should break ground in 3-5 weeks on the Hoopty. Odin’s Beard! Finally, progress at the farm. Dropped 70 transplants into the GFC (Ghetto Fabulous Coldframe). They are mostly oak leaf lettuce. 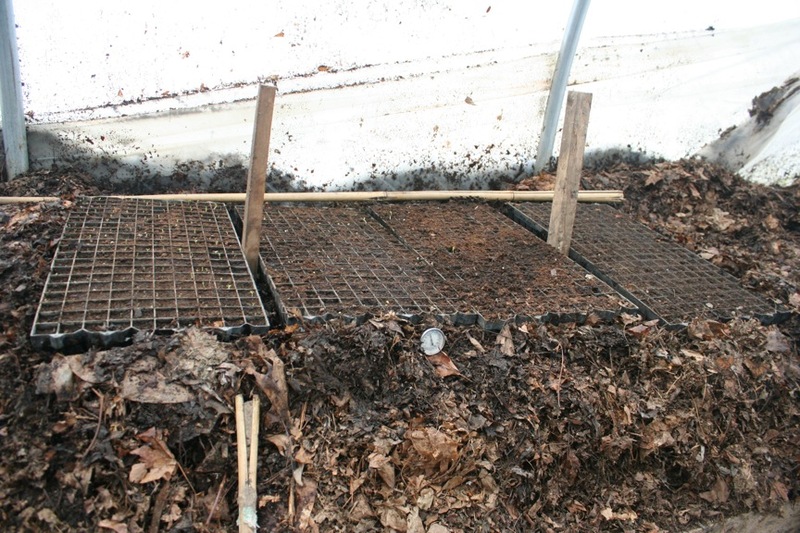 Its at least a week early, but the frost is out of the soil in there, I am antsy as all heckfire to start eating/selling fresh again, and I needed room in the germination table: these 3 flats had been decimated by voles or poor germination – leaving only 70 plants with true leaves out of 600 cells. Also, the spinach in the small hoopty is up and several plants have true leaves. With the sun forecast for the next week it is looking like March harvest may happen after all. 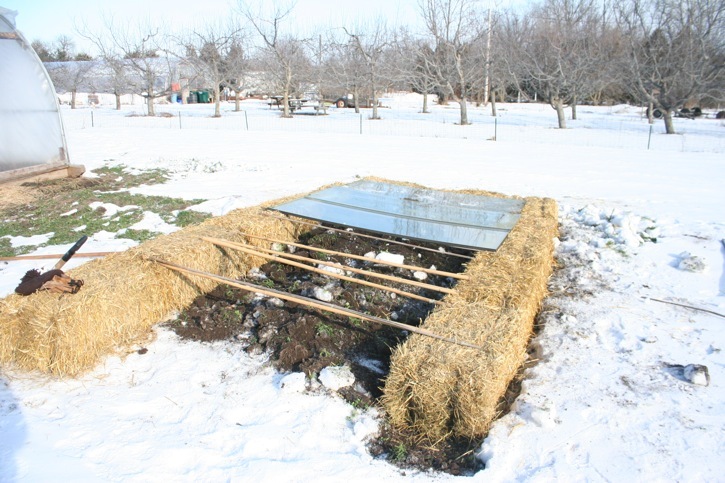 Of note, the experiments in the small hoopty played out very well: putting a cold frame over the soil gave the plants almost a 10 day head start. Putting large chunks of black bio char on the next bed got about a 2 day jump and stronger growth due to the 1-2 degree warmer soil temps. The control beds are still germinating. All good! Shallots and Onions are up with some over 2″ tall and I have another 700 germinated lettuce seedlings and am continuing to start 200-300 a week. 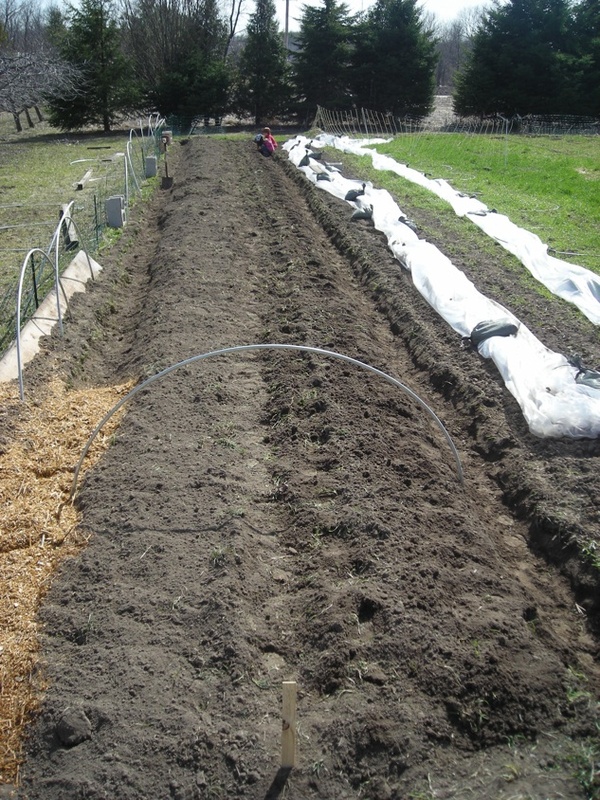 Next week will see another round of onions, and the week after will be the tomatoes. With the Uber Hoopty delayed I will not be in the ground on my April Wk 2 date, so I am starting later by about 2 weeks rather than have leggy vines. On the coppice plantings end I started 36 fodder willow cuttings 3 weeks ago, and despite doing more than half the steps wrong, I have 75% of them sprouting. In 2-3 years that will be an awesome amount of brush for compost shredding and worm mulch. These things grow fast – most have 3″ of new branches already. Dang! 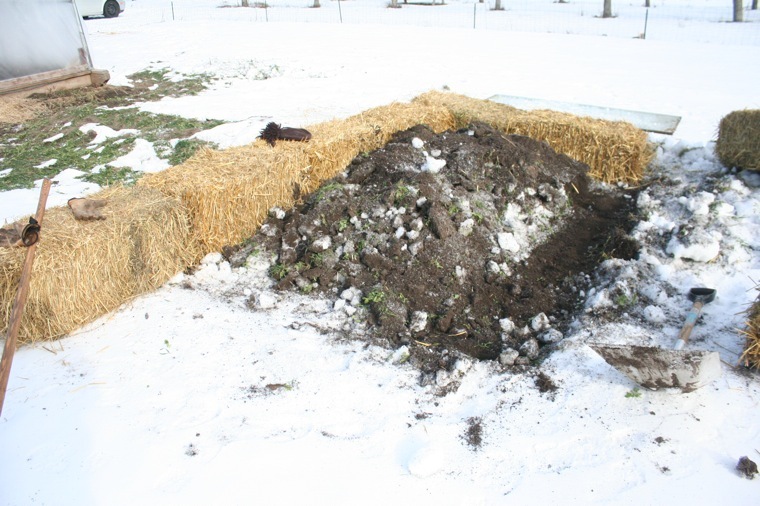 Compost Update – Harvested 1.5 yards, about a third of the pile, from the winter bins last week to spread in the mini-hoopty’s. 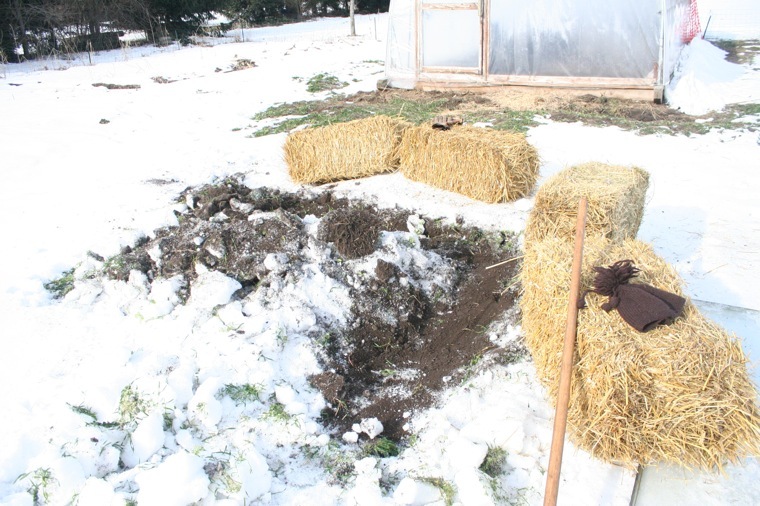 The pile was about 1-2 turns from being done, but had cooked down enough that I am comfortable tilling it under once the frost is out of the ground. Into that hole in the pile I began moving the half cooked pile from the small hoopty. 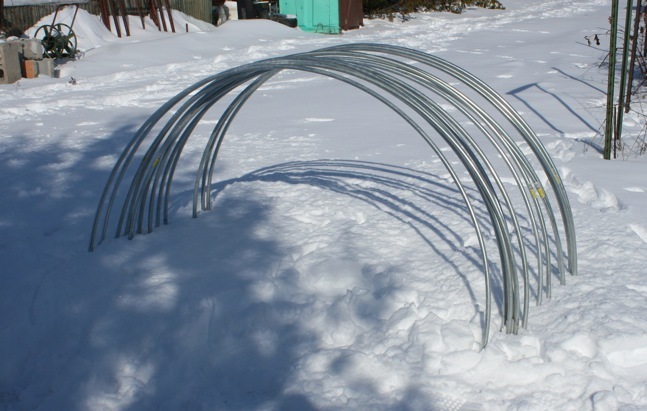 As I did this I layered in 6″ of snow between wheel barrow loads to increase moisture levels. That pile is 153 degrees less than a week later and despite being on only one side of the water barrels, has brought the water temps up 20 degrees in one week back to 95 degrees. I am certain we can make methane in this system. Jean Pain’s work WILL live on! 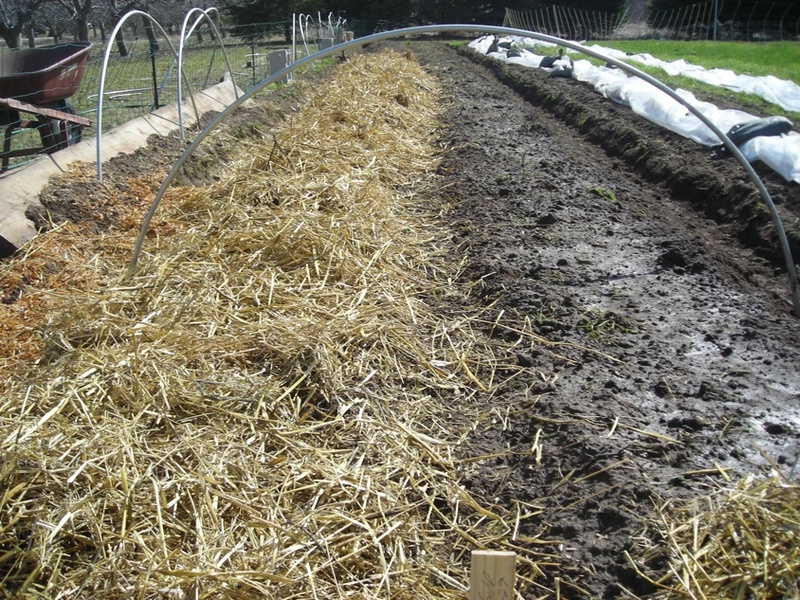 On the Energy Farm front I ran the math on how large my windrows need to be to achieve about 20 tons (80 yards) of finished compost . The results are exiting and staggering: 10′ wide, 5′ tall, and 75 feet long … and I will need three! Time to get the farmer’s old Oliver tractor tuned up, lube up the manure spreader and fill the dump truck with 10 loads of horse, sheep, lama, and cow manure. 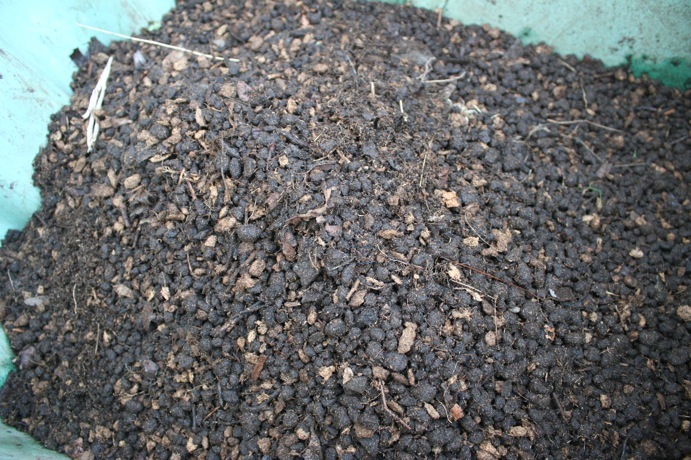 20 tons of compost means about 100,000 lbs. of raw material. Awesome! Only thing I am struggling with right now is how to keep it moist during turnings- a commercial tripod sprinkler will likely be in my future. Also, might lay drip tape on them after I turn them. Prep for the Uber Hoopty means moving or chipping up a 30’x40’x8′ brush pile of 8 years worth of orchard and hedgerow prunings. I have a used BCS Bio 80 shredder (pic) incoming to shred the compost crops later this year, but this job is likely too big for this chipper – it would take days and days. Will likley be renting a trailer mounted chipper and filling the dump truck with chips. And, yes, I am looking forward to that. The Bio 80 is also made in a PTO driven model for the Grillo, but this one is 40% of the cost of a new one’s $1100. With the left over money I can buy a Worm Wigwam. More to come on that! On the renewable energy side my CSE partners have finished a distillation tower for a Charles 803 Ethanol Still and have sourced a massive stainless steel tripod mounted tank to act as the boiler to cook the wort and heat the ethanol for distillation. Unit is nearing 75% complete. Also we have a water bath methane digester just “laying around” (the farm is a magical place!) that will get final assembly in the coming months, and we are designing a Cyclonic Separator (does that sound cool or WHAT!) to hopefully purge the last vestiges of tar from our gasifier. Add this all up and we make the Market Garden into a true energy farm. Things are stating to move at break neck speed – money is flowing in from my investors, and its flowing out even faster – I will have spent $15000 in less than a month. OMG. But I continue to hear from people all across the country how we are doing things that no one else is doing, and how inspirational that is. Its scary as hell, but I am thrilled to be pushing the envelope and to have all of you along with me for support. We will make mistakes, there will be failures, but we are doing something. Conviction + Action = Change. 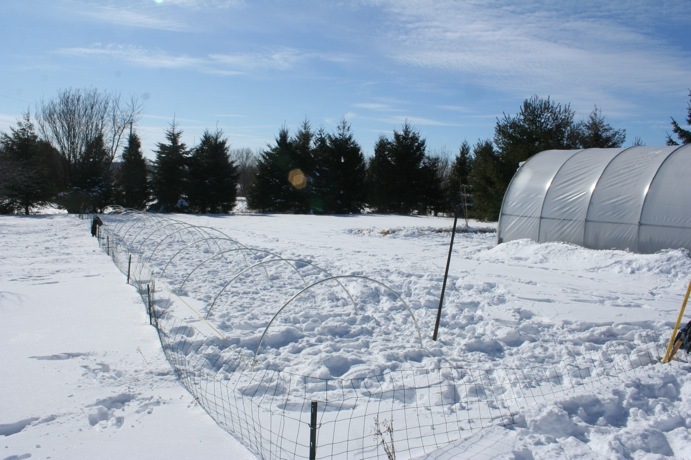 Winter Farming: Compost… Potting Mix… Sprouts! Jan Wk 3 Sprouts - no heat mat!! Things are really starting to get moving at the Market Garden. 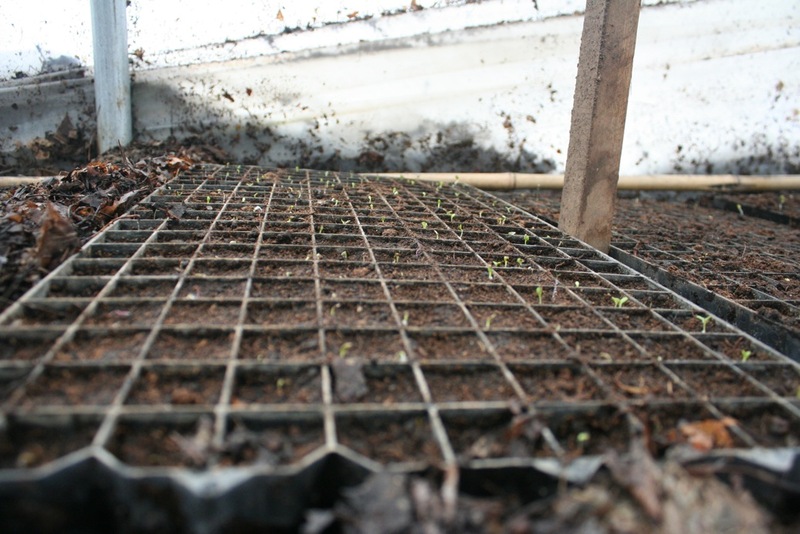 Last week saw the first seeds sown into flats, and I am VERY pleased to report that the first Oak Leaf lettuces are sprouted! And in only 5 days!!! These seeds were bought essentially on a whim – I had forgotten a packet at home and was at Menard’s for something else. Seeing organic Oak Leaf seeds for $2 I figured wth? 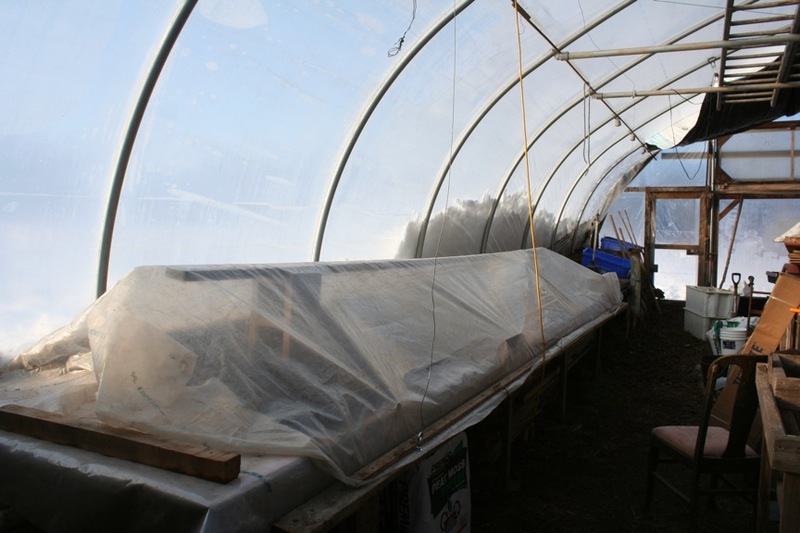 That $2 will seed 4 flats of 200 -enough for a 3 x 60′ foot bed (spaced for small heads). Not too shabby! The 3 flats that have yet to sprout were planted with pelletized seed from Johnny’s – a Jericho Romaine and a Red Butterhead. 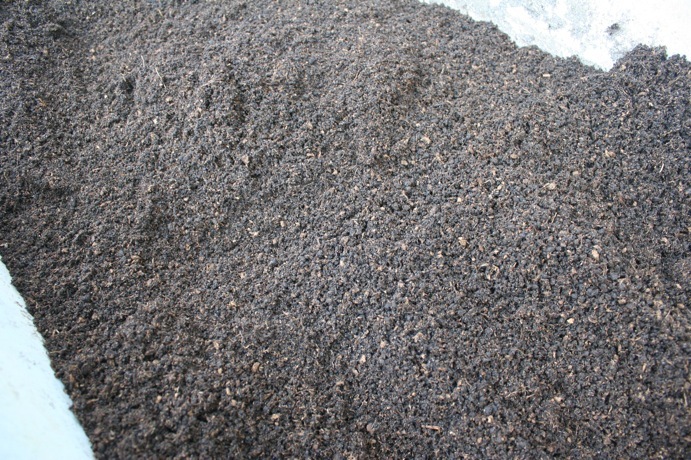 They look to be 2 days behind the pure seed – likely due to the clay pellets needing more time to soak up water. 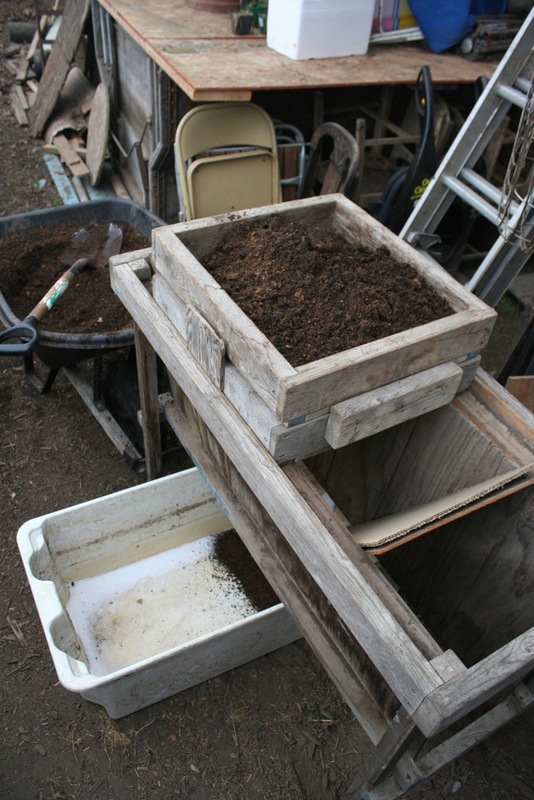 First lets talk about the compost heating method. This is the same pile we started back in the first week of December to mimic Growing Power’s techniques in using Hoop Houses to allow for 4 season composting. At home, my piles, even my monster 4 bin system, freeze solid by Christmas. 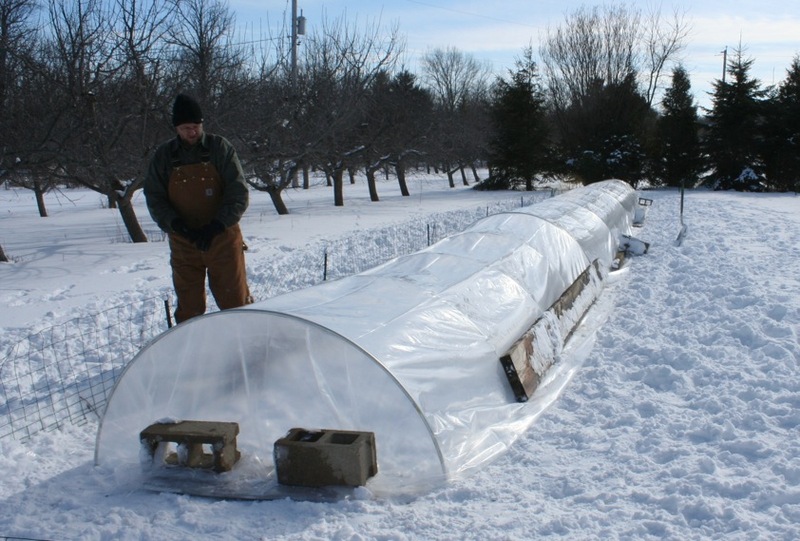 Will Allen’s Hoop Houses cut the wind and gain enough btus during the day to stay hot all winter. Our pile is still truckin along at 120-130 degrees without turning and is going on week 7. having that kind of heat is dang useful. So when the time came to start my lettuce for the cold frames, rather than unroll the 12′ heat mat, I scraped the top of the beds flat and nestled in 4 flats of lettuce. The two scraps of lumber are to prop up the greenhouse plastic I keep over it at night to lock in the heat from the pile. This will stop once the rest of the flats germinate as its wicked humid in there and mold is already creeping in. Mold. In January! 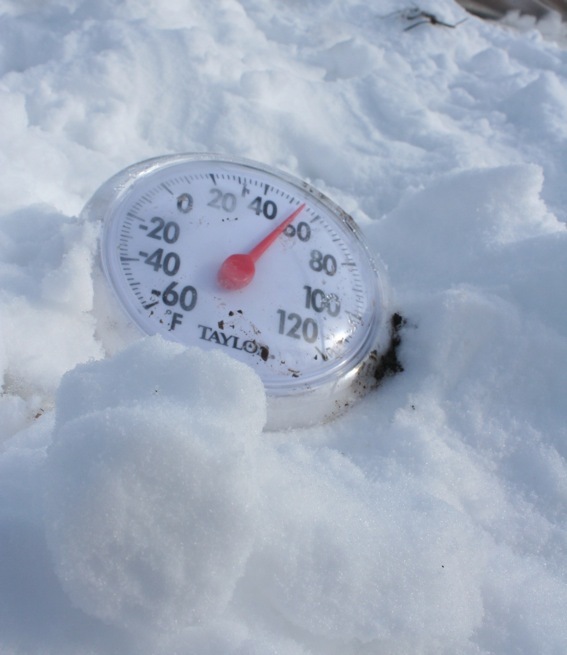 Here is a “proof” shot of the soil temp under the flats. 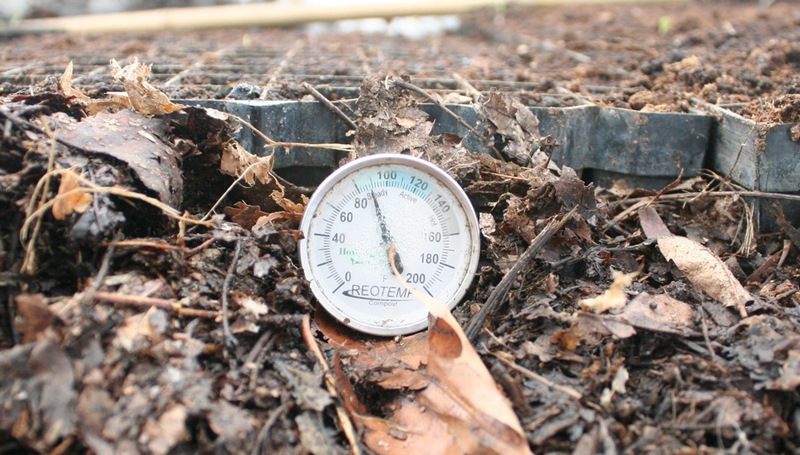 This is a 24″ compost thermometer run horizontal under the flats. 87 degrees (air temp outside 22, inside 38) - yep that should do it!! A bit more on the compost pile. While we haven’t fully turned it, we have primed it a bit. Every week we add about 10 gallons of material by digging a hole in a section and pouring in two buckets of gorp from the coffee shop. We then cover this will about 4″ of leaves. 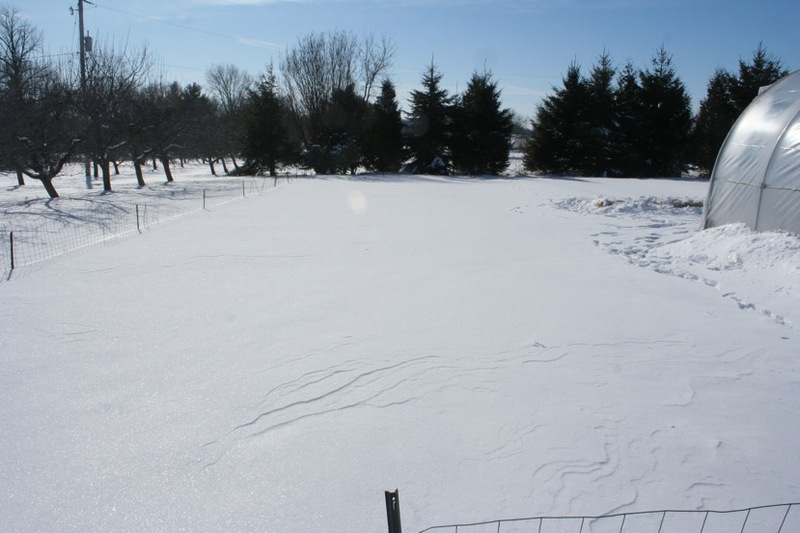 As the pile dries out we shovel snow onto the top and this seems to be keeping it nice and evenly moist. The worms are loving it – we are seeing our first hatchlings now which is super exciting. The wigglers move around an amazing amount in search for the conditions they want – the right mixture of food, temperature, acidity, and moisture. Its super fun to try to guess where they have moved to on any given day. The top tray has a 1/2″ grate on it and is nested on top of a 1/4″ screen. Both are simply hardware cloth screwed to the bottom of the frames. 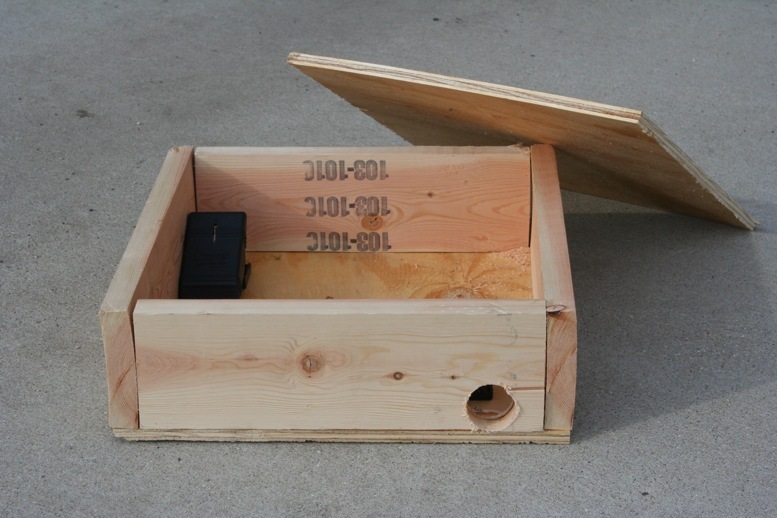 The Sifter frame is 2×2 pine with 2×4 bracing around the top. The plywood is 1/4″ and provides alot of stability. The internal “chutes” allow for a reduction in the sq footage so that a rubbermaid or some other container can catch the product. Because they are angled, you still have enough room on the top for a good push/pull stroke. 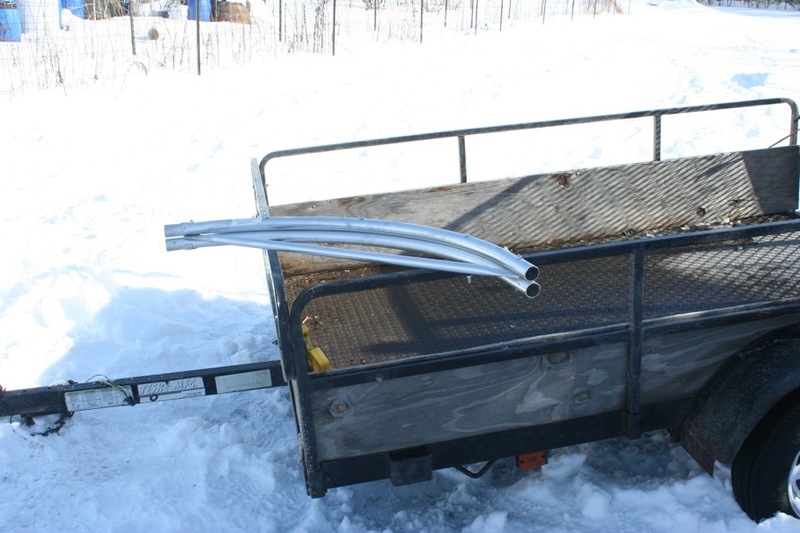 I built one of my own at home and sized it to drive my smaller wheel barrow under it and skipped the nested sifters, opting for only the 1/4″ – though if I were to do it again I would compromise for 3/8″ in the name of speed. The results? "Junk" compost. This is typically put back into the compost pile. Yes, this is even better in real life. GORGEOUS! The peat moss gives it fantastic texture and prevents the mix from drying out. I have some conerns about the peat moss – its not exactly renewable. At the same time, one bag gets me enough to do something like 1-2 yards of potting soil which will let me grow upwards of 2000#s of food. Next season I will have a shredder for the Grillo and will try to grind up some leaves into ittty bitty bits (shredder comes with a 3/16″ screen)to mimic this and will do a side by side. Leaves are more readily decomposed, so those little bits may tie up nitrogen. Time will tell. In 30 minutes I made about 5cu ft of potting mix. As is usual with home made products it should prove to be superior to store bought. Why? The compost soil I used was never pastuerized to kill “harmful” organisms. That means that my seedlings will be living in a rich soil food web of bacteria, fungi, protozoa, and worm casings (which will hatch alone with the seeds!). All in all it was a great few hours on the farm. 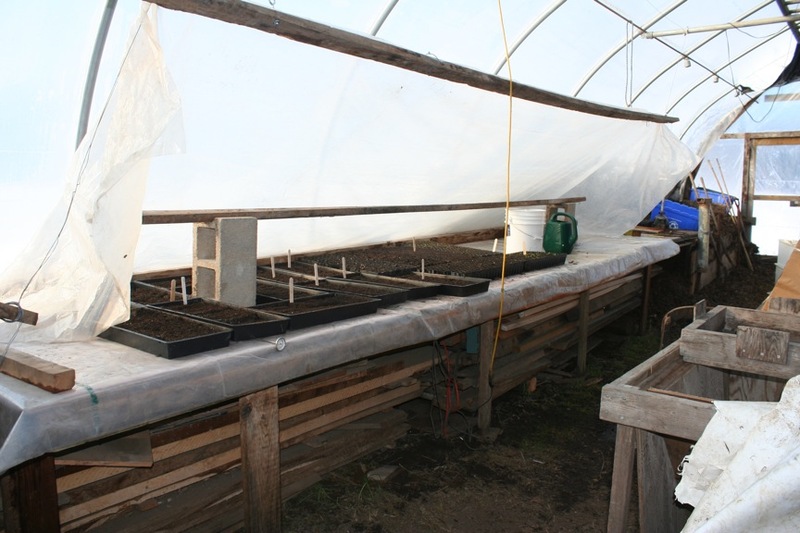 Today marked the official start of the 2010 growing season! This morning I pitched my expanded “grow list” to my first restaurant client and it went smashingly – agreements from this one account will double my gross revenue from 2009 —and it was the smaller of my two clients last year. Main increases will be in duration rather than volume – I expect to be marketing produce for a full 32 weeks in 2010! From March’s Frost Kissed Spinach to December’s storage crops of onions, potatoes, carrots, and squash this looks to be a great year. 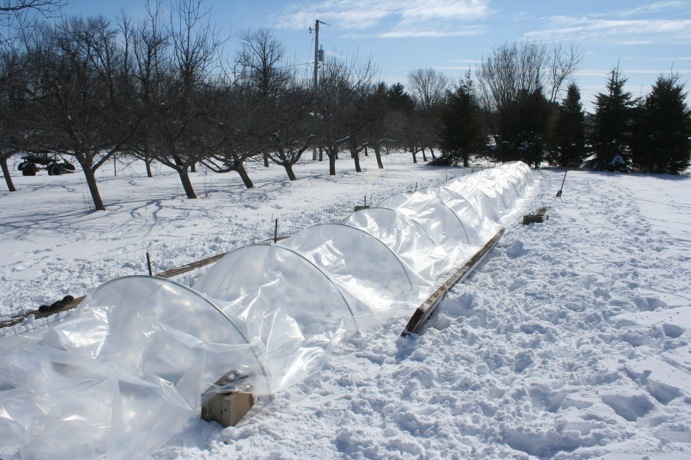 With some luck in storage next winter, the 2011 “season” may see produce sales all 12 months of the year. Awesomeness. More immediately important ,this afternoon I planted the season’s first seeds (70 sq ft of Bloomsdale spinach) and placed my first order for seeds. 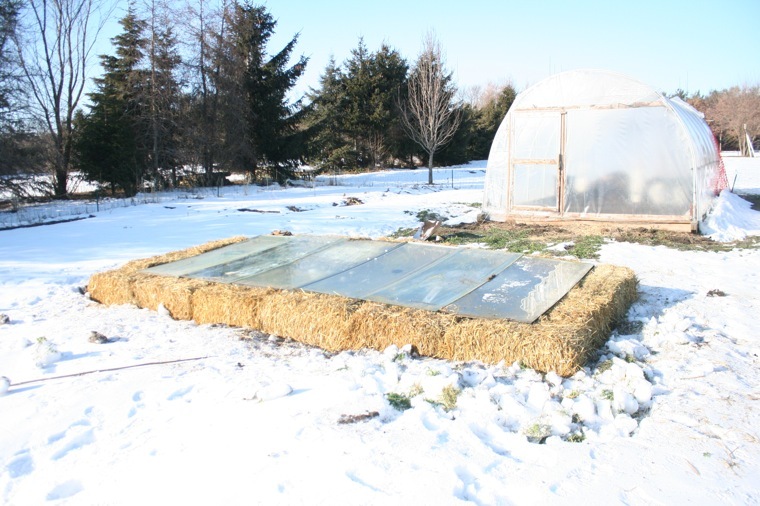 The Hoop House (11×25, not the proposed monster Hoopty) soil is still completely frost free, but is wicked dry. I went no till: first scraped the soil with a scuffle hoe to clear the tomato debris from October, then “lifted” the soil with my U-Bar digger, then raked if flat and hand seeded the beds. Tomorrow I will plant another section with another variety of spinach. My favorite part was “watering” the seeds with 10 bucket loads of snow; it will be 35+ degrees and sunny for the next three days and I will have melted by noon tomorrow in the 80 degree heat. The first seed order for the season was for some purslane (favorite of the landowner) and half my onion seeds – about 3000 starts. Ailisa Craig, and two cippolini types: Red Marble and Gold Coin – I will begin onion starts in only a few short weeks, hopefully in soil blocks (expect a post there). 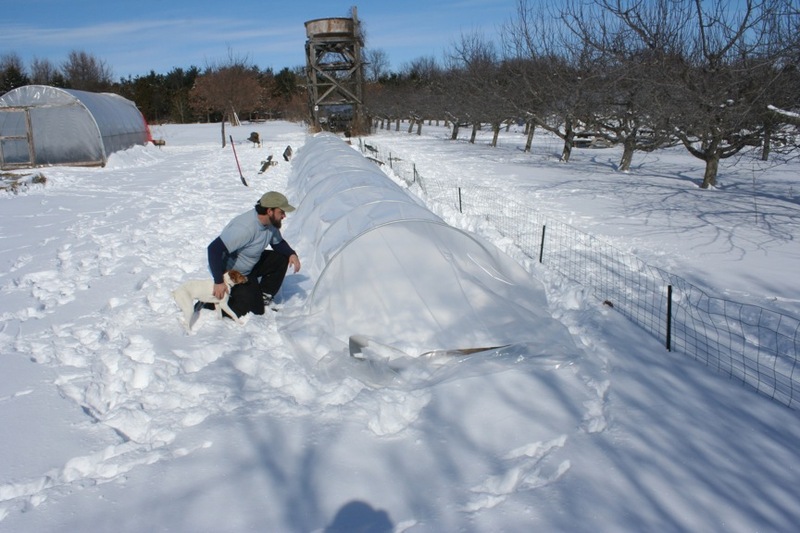 Hoop Houses make the winters very short indeed!